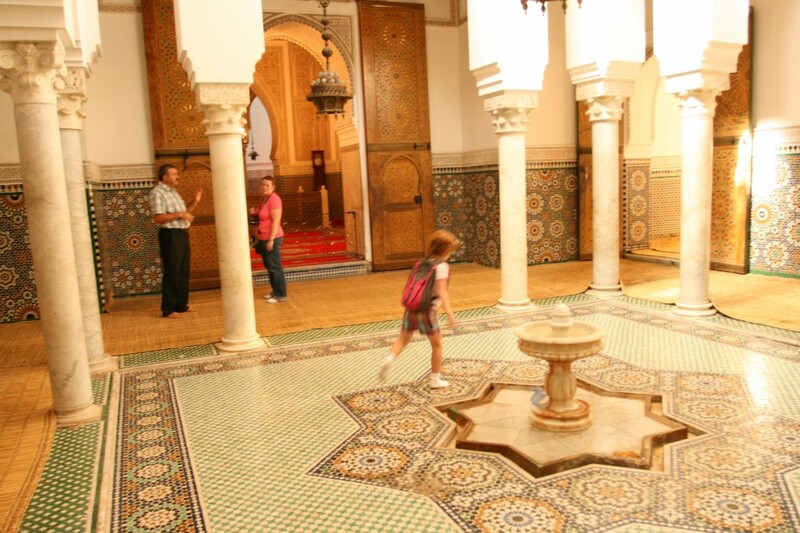 We started the next day Meknes which is about an hour from Fez. 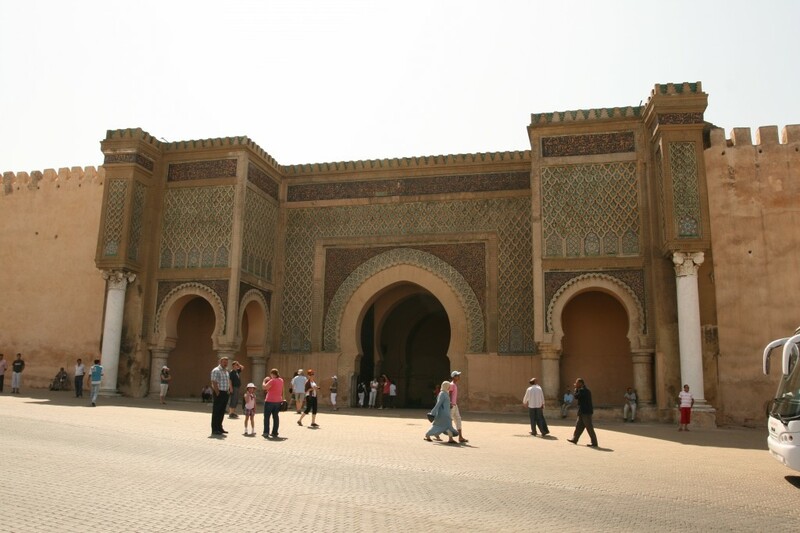 There we saw the grand Bab Mansou gate, the Mausoleum of Moulay Ismail and an underground prison that ran under the city once held over 20,000 people. A real ‘Midnight Express’ type place, luckily it had been cleaned up a bit… After a quick lunch back in Fez we toured a local ceramics factory to see what the local artisans were up to. Sydney got to witness them fire up a kiln that was fueled with wood and olive pits. The pits are a cheap local source of fuel (almost free we were told) and the oil in them make a good fuel; in a demo the tossed a hand-full into the new fire and flame came shooting back. 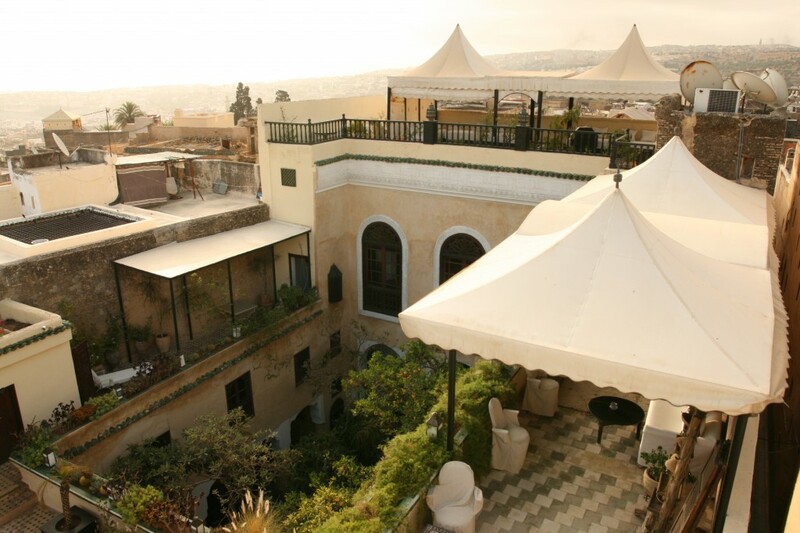 Finally we managed to wear Kim and Sydney out so back to the Riad for them while Jamal (the guide) and Tom walked the olds sections of Fez just to see what we could see. A hugh variety of people to see, very rich on the eye. 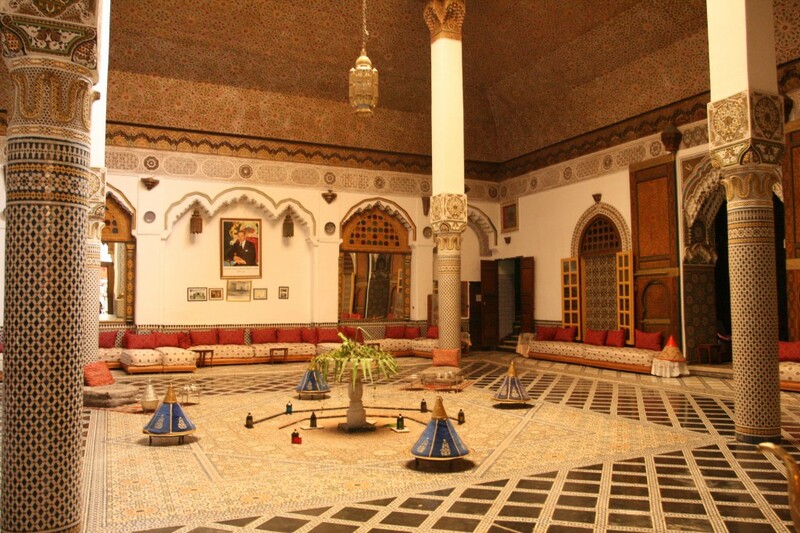 Jamal grew up in Fez and new many people and things to see. He said it had changed quite a bit, foreigners are buying up property and Riads that cost about $35k when he was young are now going for over a million US dollars and the result usually does not benefit the locals. Also pollution has gotten very bad and a river that he used to fish in is now essentially an acid bath due to the metal work in the city with no controls. Very bad. Still a great experience and a great workout. Want a new exercise? 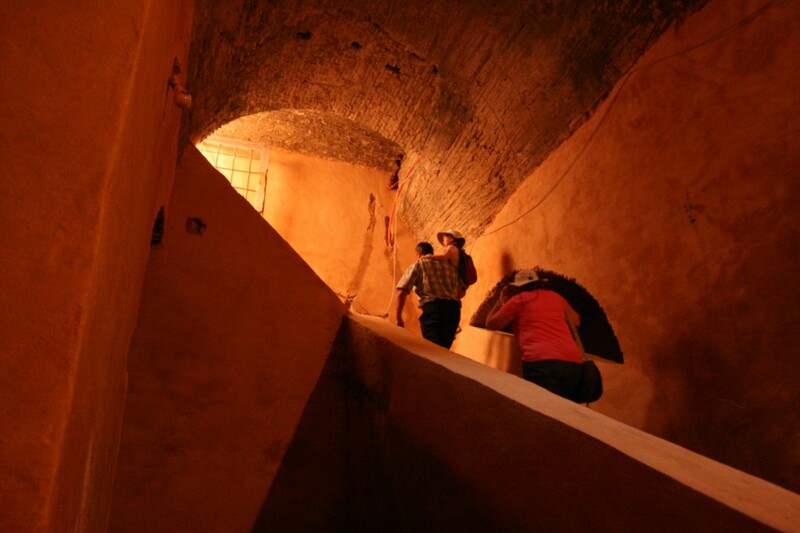 Try several circuits of the old city of Fez with lots of up and down paths and people and object dodging. You get a heck of a workout! Palais Mnebhi, once a palace, now a resturant. Posted by tdelora on Monday, August 10, 2009, at 10:12 am. 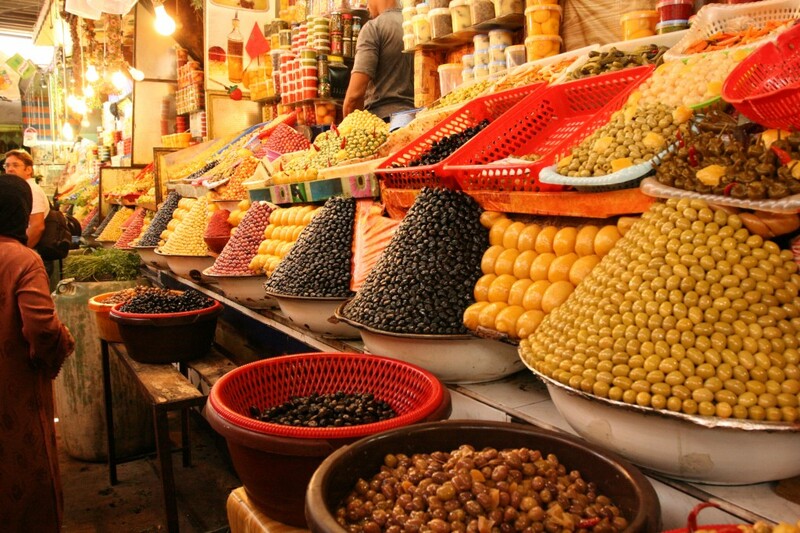 Filed under Alcohol, Fez, Morocco, Travel. Follow any responses to this post with its comments RSS feed. Both comments and trackbacks are currently closed. Nice travel log, I loved the picture of the stacked olives. I wonder what would happen if someone pulled an olive from the bottom? Looks like you are having fun and learning a lot.